Christendom College will honor the 110 members of its 39th graduating class during Commencement Weekend, May 11-13. 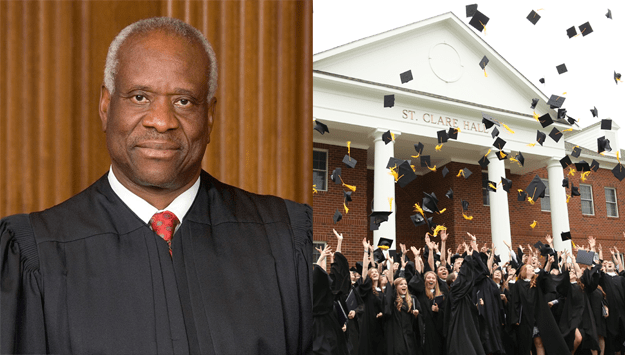 Supreme Court Justice Clarence Thomas will give the commencement address at this year’s ceremony on May 12, and will be awarded the college’s Pro Deo et Patria Award during the exercises. Fr. Paul Scalia — the son of late Supreme Court Justice Antonin Scalia — will offer the Baccalaureate Mass for the graduates and their parents on May 11. SCOTUS Justice Clarence Thomas will join the 39th graduating class for Commencement. For more information on this year’s Commencement Ceremonies, please visit here.